Their true magic lies in the way they touch the heart. 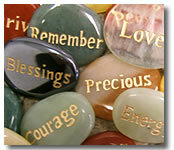 Words engraved on semi-precious stones and river rocks inspire, motivate, and heal. 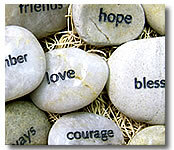 Your company or organization can make a lasting gift or keepsake of inspiration, comfort, and celebration. 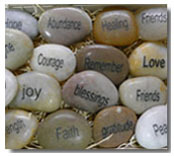 Inspiration Stones, Inc. is the original. 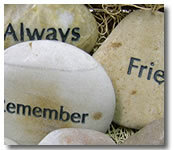 Look at our collection of Pocket Stones and River Stones and call us today.